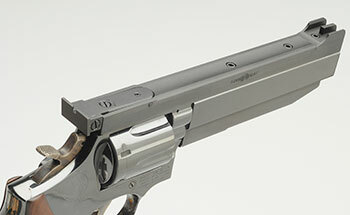 All revolver sight ribs as standard are cut for 1 inch diameter custom bull barrels. 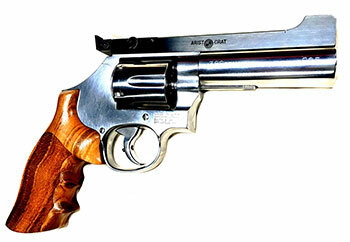 On request are available for S&W factory heavy barrels and also 1.125 inch diameter (28mm) custom bull barrels. Additional charges apply for the larger barrel cut. This new model sight rib provides a Dual Use feature of a built in Weaver style base which allows for easy mounting of many types of scopes and red dot sights. When you want to return to the Tri-Set iron sights simply remove the scope or red dot sight. The weaver style base will not interfere with the Tri-Set sight picture or sighting adjustments which will always remain unchanged. Now it comes with the New High Guard front sight. The higher guards help with faster sight acquisition by eliminating the chances of mistaking the guard for the actual sight post. The New High Guard also helps with lighting conditions and controlling shadows. 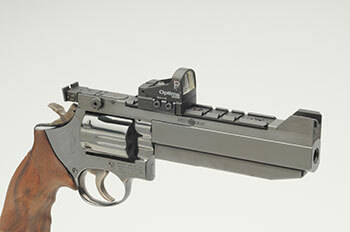 It features a new modern look but the undercut front sight, with the best and sharpest sight picture, remains unchanged. Whether your shooting sport is metallic or paper targets or both you now have the convenience of easily changing to your favorite sights anytime. All of this is now possible with one target pistol. 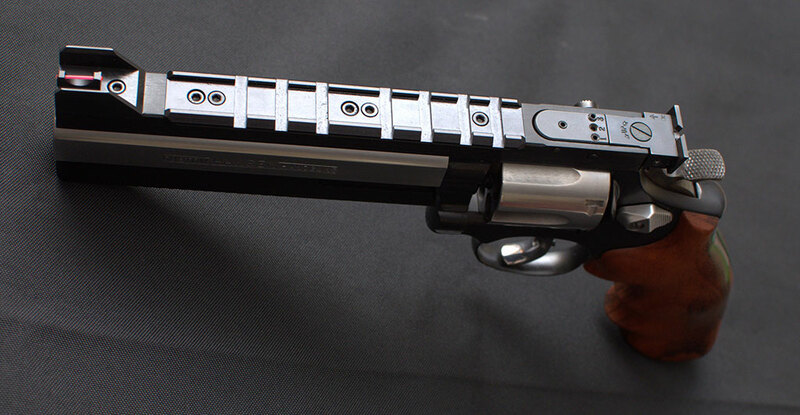 It is recommended that the installation of this product and all of our products be installed by a qualified professional gunsmith. 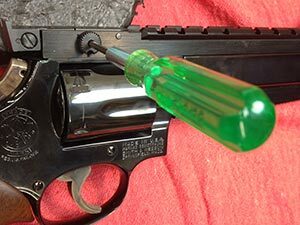 Watch our video on how to remove and install a Tri-Set Rear Sight Assembly on a Revolver Sight Rib. All Sight adjustments are made on the rear sight. Range selection is made simple by rotation of a 3-position cam. Shown with our thumb adjustable cam. 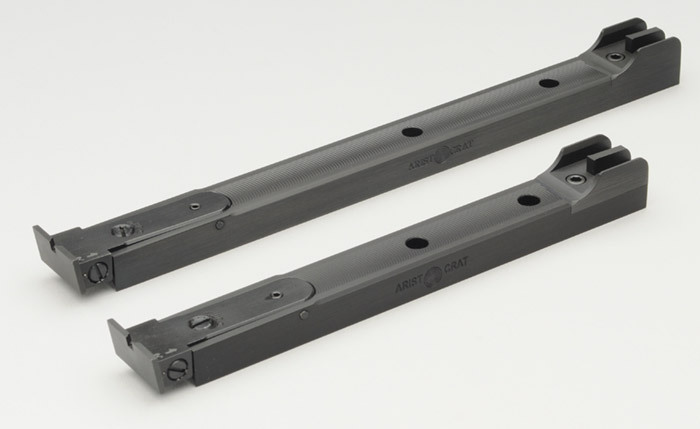 Precision sight ribs machined from solid steel bar. All wear points are hardened for long service life. Designed specifically for PPC competition, the precise user pre-settable adjustments allow for range and ammunition variables. Undercut front and rear sights present the best sight picture ever. * In between any of the three cam settings the cam should not be pulled from the adjusting side or pushed from the opposite end. Designed for conventional target shooting, the Model ASR-6 incorporates elevation screw adjustment with Aristocrat's quality sighting features. NOTE: ASR-4 aluminum body only, ASR-6 steel body only. 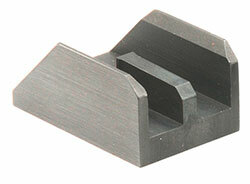 New Front Sights For All Tri-Set and ASR model Revolver Sight Ribs! Have an older sight rib? Give it a new look and enhance the sight picture. The front sights are easily changed. 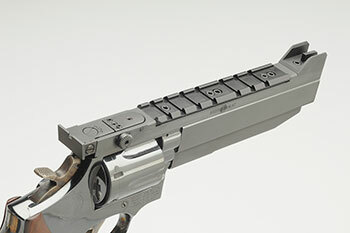 Our new High Guard front sight enhances the sight picture and the looks of the sight rib too! The higher guards improve lighting conditions, shadow issues and also help with faster sight acquisition by not mistaking the guard for the sight. The sharp sight picture from the undercut front sight which Aristocrat is known for remains unchanged. 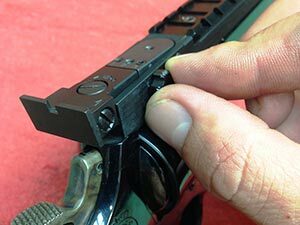 Click here to download instructions for changing the front sight. 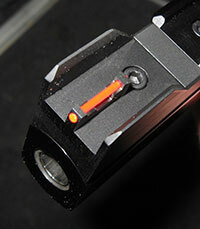 Fiber Optics are now an option with the High Guard front sight. 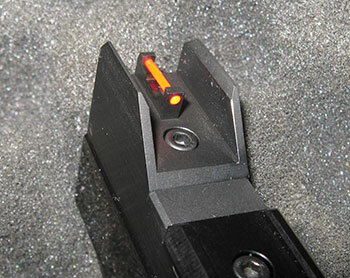 You get the improved lighting conditions from the higher guards and with an easy to see lit up Fiber Optic front sight. 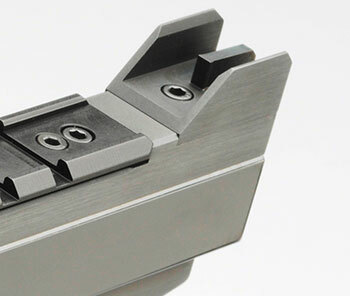 The bright Fiber Optic insert allows for quicker sight acquisition without losing the sharp target sight picture. Available with .040 (1mm) diameter rod or .060 (1.5mm). They come with the red rod installed and one extra piece of green rod is included.